Preparing meals, snacks, buffets, or beverages for a large crowd is a big job to take on. It is time consuming and requires a large amount of planning. This does not mean that it is impossible. Many caterers, professionals and non-professionals, prepare these size portions every day. There is quite a difference in preparing food for a small crowd versus a large one. Majority rules apply, and generic standards have to be incorporated to suit everyone’s palate. The first rule of thumb when it comes to large scale food preparation is cleanliness. Washing hands, sanitizing cooking stations and surfaces, cleaning and sanitizing dishes, and separating the two from raw and uncooked foods is crucial to safe catering. Washing hands eliminates the potential for spreading germs and illnesses through food. Our hands touch our faces over 1000 times a day! When serving a large crowd, you never know who is more vulnerable to illness and who is not. Keeping your hands clean while preparing food avoids spreading the flu or a virus through food and possibly infecting hundreds of people. Sanitizing all cooking stations, cookware, dishes, and utensils is also a very important component to safe catering. It is necessary to be sure all skillets are clean and dry, and anything else that contributes to the preparation of food is checked. Dishes have to be cleaned and dried and utensils need to be clean as well. It is a good idea to avoid plastic utensils to help the environment! By having all these items clean and functioning properly, it avoids contamination and the spread of food-borne illnesses. Double checking the food inventory for spoiled or contaminated products is important before preparing food for large crowds. It is possible that a stray animal or insect can gain access to food products during the commute to the venue or store. Fresh food is key to safe cooking and dining. Other than food freshness, it is necessary to ensure that deep fryers have fresh oil in them and coolers and refrigerators are working and maintaining the fresh food properly. Preparing food for a large crowd including children requires some extra attention. Since it is such a large crowd, applying majority rules as far as taste preferences is important. Pleasing children’s’ palates can be achieved by using few and simple ingredients. Kids are picky eaters so easy finger foods are a great way to keep kids entertained while eating, and gives the adults a break from having to feed them! As far as safety, eliminating potential for bones or other choking hazards in kids’ food is crucial Drumsticks should be replaced with chicken fingers, and apple slices with applesauce. Small ideas like these are safe meals for children in large crowds. Want an Easier Way to Feed a Crowd? 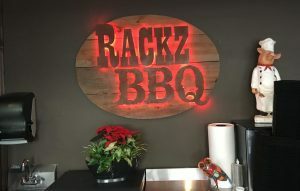 If you are looking for a simpler, more cost-effective approach to catering in Carmel, call Rackz BBQ at 317-688-7290 for authentic smoked meats and southern classics that are sure to fit the budget! We can customize a catering menu specific to your party’s theme, personal preferences, dietary restrictions, and more! We also offer delivery services, drop off service, set up, breakdown, and cleanup for all clients. This entry was posted in Catering, Cooking Tips and tagged bbq catering carmel IN, bbq take out near me, catering carmel indiana, catering safety, catering tips large group, food preparation safety. Bookmark the permalink.